We have renovated and remodelled and now greet you with exceptional Swiss flair. The themed hotel shows Switzerland to the world: every room is dedicated to one of the 26 Swiss cantons. During reconstruction, we let ourselves be guided by Swiss regions and have placed special emphasis on the use of natural, local materials. Thus, a stylish atmosphere has been created that provides our guests with modern and rustic luxury in true Swiss style. With its central yet quiet location – right in the most popular part of Zermatt, view to the Matterhorn and with his alpine flower garden – aristella**** swissflair is the ideal starting point for active holidays: the local bus and the lift stations are close by, and also the church, various museums and shops are available right in front of the door. Warm hospitality, innovative service and a strong sense of history and tradition in the hotel aristella**** swissflair create an incomparable atmosphere. 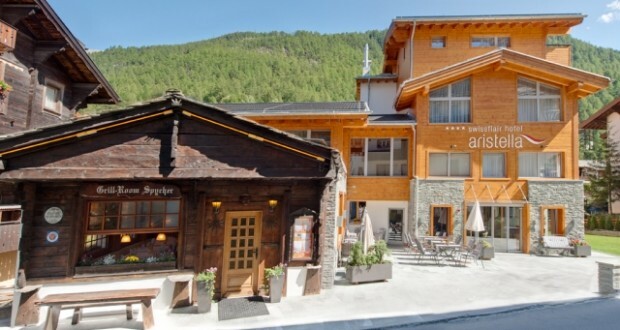 Experience modern luxury and rustic ambiance in Swiss style! We do everything to ensure your stay at the hotel aristella**** is a relaxing, wellness experience. We pamper our guests, in every way we can and, as well as the pickup service, we also offer a luggage and a laundry service. Our multilingual staff are always there for you! If you arrive earlier or depart later you can store your luggage in the hotel.